Q: Who saved the Turbine? A. The Heritage Merrickville Foundation (HMF) did in 1993. Earlier, the HMF saved the Old Town Hall in Merrickville as well as Knox Presbyterian Church. Q. Why has the Turbine been saved? A. Like the stone houses, water mills and factory ruins in and near Merrickville, the turbine was saved because the Friends and HMF thought it was representative of Canada’s early industrial heritage, in this case, hydro-electric power which had been so crucial in the industrialization of Canada. In 2011, the Friends of the Merrickville Turbine was formed by individuals concerned about the Parks Canada plan to scrap the turbine forthwith. In 2012, the Friends was incorporated, and it obtained Canada Revenue Agency charitable status. Parks Canada transferred ownership of the Turbine to the Friends in August 2012, which is now responsible for its upkeep. 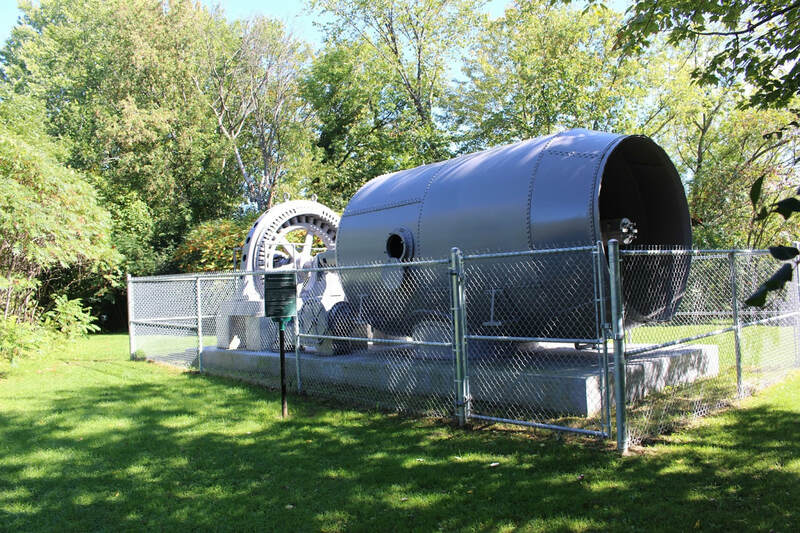 The Turbine is located in the Industrial Heritage Complex maintained by Parks Canada. The site can be reached from the main roadway that crosses the Rideau Canal and Rideau River. In 2013 significant refurbishing took place. Included were: replacement of the supporting infrastructure, careful removal of lead-based paint, application of premium environmentally respectful paint, installation of security fencing, installation of appropriate signage. The preserved equipment represents the final phase in water power development which had taken timely advantage of technological developments in other fields of industrial endeavour. Its location in Merrickville is the stuff of classical economic geography. It is no accident that the men, who arrived in the barely charted territory in 1792-3, were wily colonists of experience. Both Roger Stevens and his nemesis, William Merrick, were already well-versed in the ways of harnessing rivers for milling power. They looked no further than the Great Falls on the Rideau, for there they saw just about the highest waterfall on the river, which had the added advantage of being the nearest to the colony’s only commercial artery, the St Lawrence river. They also saw and appreciated the intrinsic value of the narrow defile, such as is characteristically associated with such waterfalls and mills. Venturers as they were, they quickly met the challenge offered and threw the first precarious tree trunks to bridge the chasm, at the same spot as is the area bridge point, still used today, so sealing Merrickville’s destiny as a bridge town, and gateway to settlements further north. Small wonder that its coat of arms incorporates a waterwheel and the motto “AD AQUAS FLORENS” - “With water we flourish”. The first hydro station was the “Electric Light Company”, promoted and owned by “Edward Kyle, son of the owner of the Malleable Iron works”. It supplied electricity for street lighting and homes. The station first opened in 1894 and was located on the north side of the river, at a time when the reach of the river was controlled by two dams - an upper dam, first built as part of the original canal in 1832 and replaced several times between then and 1914, and a dam at William Merrick’s first site. The second hydro project with two generating units was conceived, and then promoted, by the Rideau Power Company of Merrickville in 1912. It anticipated construction of a new high dam, which would double the available head for power generation. The promoters “included the Kyles, Watchhorns, Mills and Percivals, owners of mills and factories operating on sites adjacent to the river and reliant on water power” The preserved Turbine is the first unit installed. . The Rideau Power Company was “provincialized”, when Ontario Hydro purchased its stock in 1957. Ontario Hydro installed new equipment in 1993, which increased power and energy output. Its successor, Ontario Power Generation (OPG) now operates the station. PENSTOCK/INLET PIPE: riveted steel boiler plate, thickness, ½ inch, (12mm), Diameter, 100 inches (2.5m). TURBINE Manufacturer: William Hamilton and Sons Ltd, Peterborough, ON, (c1856 -c1930). Type: horizontal axis, double runner, Smith-McCormick type. Head 25 feet (8m). Max discharges: 450 cfs/unit (7.5 m3/s). Maximum turbine rating - 616 hp or 460 kW. (In this era, turbine characteristics were quoted in the fps system). GENERATOR: Manufacturer: ASEA, now ABB of Vasteras, Sweden, (1883 to present). Dealer: Kilmer, Pullen & Burnham, Toronto, ON. Frequency: 60 Hz, Power 575 kVA, power factor 0.8. GOVERNOR Manufacturer: Lombard Governor Company, Mass, USA. , (1894-c1970) type “O" governor, horizontal, oil pressure, Actuator mechanism is probably Porter type. Built with the high dam in 1914-15, two units: Unit #1, commissioned May 1915; Unit #2, 1919. Gross head: approx. 8m, connected to Rideau Power System at Smiths Falls. Hydropower has been proven to be the greenest by a large margin. 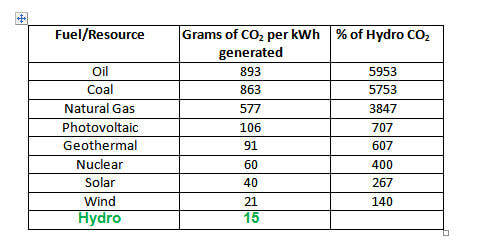 In a multi-country study of total carbon emissions, including those used for construction, equipment manufacture and energy conversion, hydro proved to be 40% cleaner than the next alternative (wind), and 50-60 times cleaner than fossil fuel generation as shown in the table below (source: Vatenfall AB, Sweden, 1999).